He used to rub shoulders with local celebrities Fann Wong and Andrew Seow and was earning up to $30,000 a month as a fashion journalist and stylist for magazines such as Style, Prestige, and Men's Health. But Mr Luke Lim, 35, said he always felt empty and unsettled during his 11-year career in the fashion industry. Eventually, he gave it all up to pursue meditation. He recalled of his work, first as a fashion designer, then as a stylist and magazine contributor: "I kept changing roles within the industry and never felt satisfied and fulfilled." Despite winning the Fresh Fashion Stylist of the Year Award during the Singapore Fashion Awards in 2004, he began to experience depression, he said. He also found that he had little motivation to continue working. Mr Lim's turnaround came in December 2011 when he confided in his client and friend, Ms Krista Kim, an artist in her 30s. She introduced a book to him, elements of which discussed the practice of mediation. Never the kind of person to sit still, Mr Lim remembered dreading the notion of sitting quietly for long periods of time. But he felt he had nothing more to lose and decided to give it a try, he said. He took to it like a fish to water. Said Mr Lim: "I followed the instructions in the book and was shocked at how fast I saw results." He began by calming himself down and relaxing his body and said he quickly felt minute tingling sensations when he was most focused. "I felt a joy that I'd never felt before," he said. He felt compelled to share his life-changing experiences with others and dropped his fashion career to become a spiritual teacher, founding meditation interest-group the Singapore Lightworkers Guild and a YouTube channel to educate others about meditation and spirituality. Today, Mr Lim says he is happier than ever with his new life. 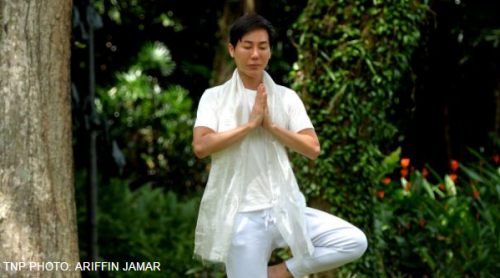 He is a full-time meditation and yoga teacher who holds weekly lessons with up to 30 participants in each session and he meditates three times a day at his Pearl Bank apartment. He has also influenced his parents to take up the practice. "Meditation is the best thing that has happened to me."